APPEARANCE: Black…but a thin black. Does that make sense? No? Shut up. NOSE: Some dark malt and chocolate. A lot of lageresque grass clippings and a touch of leather. And a fairly pronounced, pine resin hops aroma. Certainly an interesting and provocative nose. TASTE: Big unsweetened chocolate and burnt coffee flavors in the beginning and bitter hops in the finish. They play off each other well and are punctuated with the flavor of dark, pumpernickel bread and just a wisp of sulfur. MOUTHFEEL: Looks like a stout, but drinks like a schwarzbier meaning somewhat thin-bodied and light. DRINKABILITY: Quite drinkable and refreshing. Wifey McHops really enjoyed it and would have gotten another had we stayed longer. She commented that the term “Dry-Hopped” concerned her but that it was not overly bitter at all. 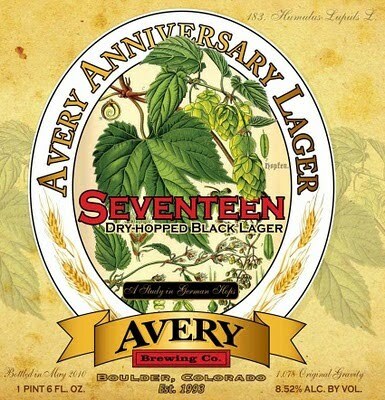 Posted in Tasting Notes.Tagged 17th Anniversary, Avery, Dry-Hopped, J. Clyde, Schwarzbier.